The Ring Nebula in Lyra lies 2.300 light years from Earth. It is estimated to have been expanding for about 1600 years. Avid skywatchers Bob and Janice Fera took this stunning image June 23-27, 29-30, July 1, 2011 from Eagle Ridge Observatory, Foresthill, Calif. The Ring nebula shines at about a magnitude +8.8 on the reverse scale used by astronomers to measure the brightness of objects in space. On that scale, the lower an object's magnitude number, the brighter it appears in the sky. Objects with negative magnitude numbers are extremely bright. The limit of the unaided human eye for seeing objects in space is about a magnitude +6. 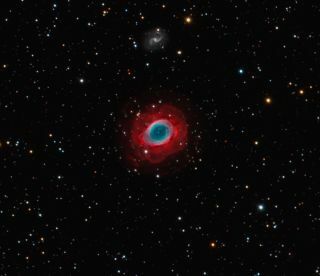 So the Ring nebula's magnitude +8.8 places it beyond the range of human eyesight, but makes it a stunning target to observe with even small telescopes.